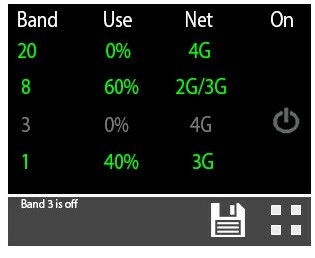 The SD-LCD-LGDW is one amazing device from StellaDoradus, that you can use legally in Ireland to boost your weak GSM, 3G and 4G signal all at the same time. It is perfect for small offices, apartments, basements, dorms and other small areas where signal is too weak for hassle free use. The StellaBoost L4 (SD-LCD-LGDW) has one unique feature which is not on any SD signal repeater models. This models comes with touch-enabled LCD screen. 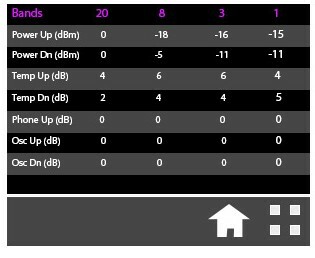 It allows you to control the bands with precision. You can with on/off any specific frequency band, turning the device into a pure 4G or perhaps, a voice only booster. You can also attenuate and balance the bands as you see fit. 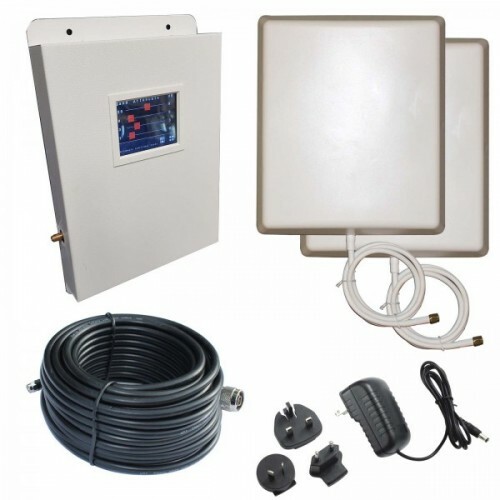 This product comes ask kit, in the box you'll fine the signal amplifier, two panel antennas - one for indoor (transmitter antenna) and one for outdoor (receiver antenna), cable set for connecting the antennas, power supply and user's manual. The outdoor/external panel antenna is installed outside your building where you have at least 2 steady signal bars. The kit is very easy to install and requires no rocket science. It seamlessly amplifies the mobile signal from outside where there is a not-so-good signal, and sends it around your house. The external antenna receives weak signal (i.e. 1-2 bars) from all operators in your specific area. Signal can be of GSM, 3G or 4G or all at the same time. The weak signal is sent inside the building through a 12-meter cable to the SD-LCD-LGDW repeater device, where it is; filtered, interference controlled and amplified. The amplified signal is then re-transmitted throughout the target area by the indoor antenna. The SD-LCD-LGDW amplify signal on frequency bands; 800MHz LTE, 1800MHz LTE, 2100Mhz 3G and 900MHz GSM Voice. So all known bands and used in Ireland are all covered. You can use this booster for all networks, like; Vodafone, Eir/Meteor, 3, Virgin and Tesco. B20 (800Mhz): Great for rural locations and fast 4G speeds. B1 (2100Mhz): This option is great for slow but stable 3G data speeds and good quality calls, in urban locations. B8 (900Mhz): This option is great for voice calls in rural locations. The outdoor/external panel antenna is installed outside your building where you have at least 3 steady bars of steady mobile signal. (5-6 even better) The kit is very easy to install and requires no further attention once you plug it in. It seamlessly amplifies the mobile signal from outside where there is good signal, and sends it around your house. 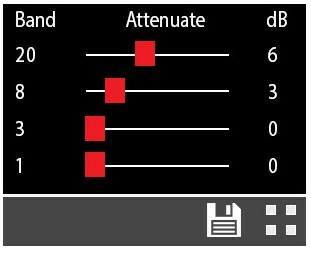 Here you can see detailed values of all the parameters in Decibels. 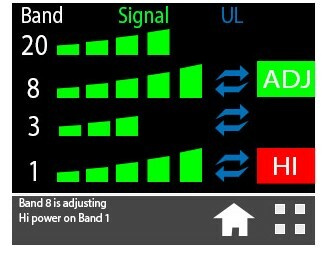 Here you can view the signal strength per band displayed with green signal bars. There is a status window below that tells you whats going on. HI: This tells you there is a lot of signal power coming down from the antenna. No action required. 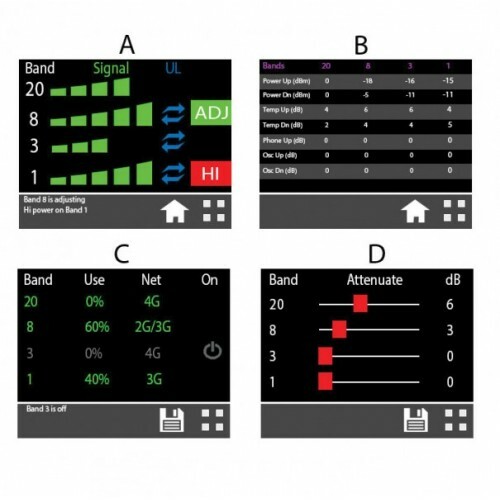 Here you can see which bands are used the most and you can also switch on or off any band. The coverage of the SD-LCD-LGDW signal booster is 800m2 in open space. In practice, this is equivalent to an estimate of 3-4 large sized rooms in a typical house. The building materials of your house, for instance, plaster walls or concrete block walls. The signal strength outside your house. 5-6 signal bars will give you greater indoor coverage compared to 1-3 signal bars. What Are the Things I Need To Know Before Buying? Before buying any mobile phone signal boosters for your home or small office, make sure and take note of the signal frequency you are receiving in your area. GSM uses 900MHz frequency band, but some mobile network provider transmits their signal at 900 or 1800 MHz or both. So make sure you have taken note of the details. But for the SD-LCD-LGDW model, no need to bother on frequncies, as it supports all the bands and will work in boosting all networks in Ireland, or even networks in EU and the rest of the world. If you need installation assistance, you can contact us and we'll install the booster kit for you. We're StellaDoradus' official distributor and signal booster installer in Ireland. To buy the SD-LCD-LGDW signal repeater/booster kit, you can call us to order using this number +353 22 23440 or use the "Add to Cart" button on this page and go through the secured checkout process. You can pay using your Credit Card via the Secured Stripe Payment Gateway. All orders are shipped via express delivery and are normally delivered within 1-4 business days. Your order will be dispatched directly from our premises and you will be provided a tracking information for your order, after it is dispatched. If you have any questions on your order status, please contact us. Read this before buying your Signal Repeater. If you're looking to boost your 4G signal either in your home or office, then the SD-RP-1002-L signal repeater kit is the best one for you. It boosts your 4G signal (800MHz only) for all major mobile network providers in Ireland, Europe and the rest of the world. Take note though, that this kit will.. In Ireland, the three GSM Network infrastructure owning networks are; Eir Mobile, Vodafone Ireland and Three Ireland. In case one of them is your favourite but you're on a certain area where signal is too weak for a clear and uninterrupted voice call, then the only and guaranteed solution will be to..
You can use SD-RP1002-D signal repeater kit to boost your 4G/LTE signal at home. It can also be used in small offices, halls and function rooms. You need at least 1 signal bar outside your home/office in order for this device to function properly. This device will take the weak signal from outside, .. The SD-RP1002-W is a mobile phone signal booster kit for 3G frequency. It comes as kit and includes the repeater deivce, outdoor antenna, indoor antenna, power supply and cable. 3G Repeater For Your Home or Office Provides 3G signal at 2100Mhz Manufactured in Ireland Legal and fully EU compliant Bo.. The SD-RP1002-H Features Provides 4G signal for your home Frequency: 2600Mhz Manufactured in Ireland Legal to use in Irelandand fully EU compliantComReg Approved Boosts all mobile operators Everything included for complete installation Coverage: ~4 rooms No Sim card required, no extra bi..
GSM 3G repeater that Can Boost Voice and Data in your Home or Office Provides GSM and 3G signal in your home Frequency: 900Mhz + 2100Mhz Manufactured in Ireland Legal and fully EU compliant Boosts all mobile operators Everything included for complete installation Coverage: ~4 rooms No Sim card requ..
Actual Signal Repeater Kit Installed in Co. Cork, Ireland. Looking for a dual-band mobile phone signal booster? Then look no further! The SD-RP1002-G signal repeater kit from StellaDoradus is the best booster you would ever need. It amplfies to signal band, one for GSM and another for 4G/LTE. Tak..
Quick Features Provides 3G + 4G (1800Mhz) signal for your Home Frequency 1800Mhz + 2100Mhz Manufactured in Ireland Legal and fully EU compliant Boosts all mobile operators Everything included for complete installation Coverage: ~4 rooms No Sim card required, no extra bills..
Are you searching to solve you weak signal problem? Then your search is over! The SD-RP1002-LG signal repeater kit will both improve your GSM and 4G/LTE signal in no time. This kit is the perfect solution to boost 800MHz 4G/LTE signal and GSM Voice signal both at the same time. One can use his/her c..
Tri band repeater kit | Boosts 900Mhz, 1800Mhz and 2100Mhz Provides GSM , 3G and 4G (1800Mhz) at home. 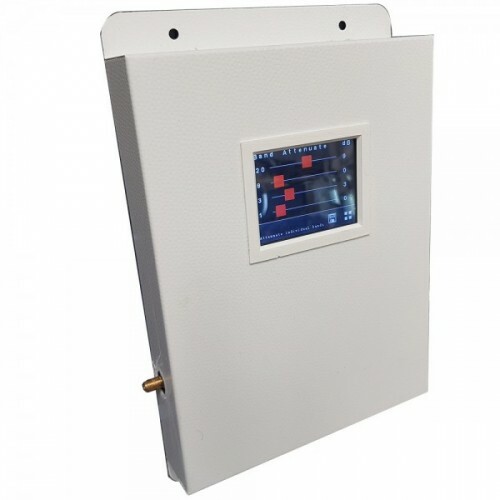 Frequencies: 900Mhz, 1800Mhz and 2100Mhz Manufactured in Ireland Legal and fully EU compliant Boosts all mobile operators Everything included for complete installation Coverage: ~4 rooms No Sim ca..
Triband Repeater Kit | Boosts 800Mhz, 900Mhz and 2100Mhz Provides GSM , 3G and 4G Frequencies: 800Mhz, 900Mhz and 2100Mhz Manufactured in Ireland Legal and fully EU compliant Boosts all mobile operators Everything included for complete installation Coverage: ~4 rooms No Sim card required, no extra .. If you're asking how to boost your cell phone signal for GSM and all 4G/LTE bands, then you came to the right place on the Internet. 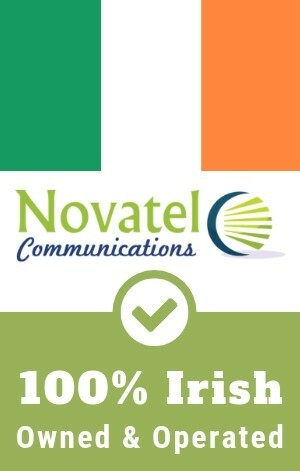 Here at Novatel Communications, you can buy the best booster for all networks in Ireland. Vodafone, EIR/Meteor, Three, you name it! All these networks are supported, a..
Quick Features Provides GSM signal at 900Mhz for your large building. Coverage: 4000m2 (up to 15 rooms) Compatible with all European mobile operators. Unlimited number of calls / data sessions at the same time. CE certified Signal power and diagnostics indicator. Manufactured in Ireland Complete op..
Quick Features: 3G Repeater 900Mhz + 2100Mhz Provides GSM + 3G signal for large buildings Coverage 4000m2 (~15 rooms) Frequency: 900Mhz + 2100Mhz Compatible with all European mobile operators. Unlimited number of calls / data sessions at the same time. CE certified Signal power and diagnostics indi..
Signal Booster for GSM (900Mhz) and 4G (1800Mhz) to expand signal coverage in your office or large installation Quick Features Amplify GSM and 4G (1800Mhz) in large buildings Coverage: 4,000M2 (up to 15 rooms) Frequencies: 900Mhz and 1800Mhz. Unlimited number of simultaneous data calls / connection..
GSM+4G Signal Repeater - Boosting mobile signal in your office Provides GSM and 4G signal in your home or office Coverage: 4000m2 (up to 15 rooms) Frequency 800Mhz + 900Mhz Compatible with all European mobile operators. Unlimited number of calls / data sessions at the same time. Ce certified Signal..
900/1800/2100Mhz Signal Booster for Office and Large installations Provides GSM + 3G + 4G (1800Mhz )signal for large buildings Frequency 900Mhz / 1800Mz / 2100Mhz Coverage: 4000m2 (up to 15 rooms) Compatible with all European mobile operators. Unlimited number of calls / data sessions at the same t.. The 800/900/2100Mhz Repeater Provides GSM + 3G + 4G signal for large buildings Frequency 800/900/2100Mhz Coverage: 4000m2 (up to 15 rooms) Compatible with all European mobile operators. Unlimited number of calls / data sessions at the same time. CE certified Signal power and diagnostics indicator. .. The SD-RP-1002-LGDWH-4 5 band repeater boost all networks (GSM, 3G and 4G), covering all signal frequencies here in Ireland. It can work on 800, 900, 1800, 2100, 2600 MegaHertz frequency bands. This model is ideal in boosting signal in large areas like offices and multi-storey buildings. It works on..